James brings years of successful selling, marketing and management experience to the seminar and speaking circuit. Early in his career James had the good fortune of working with the Dale Carnegie organization in Michigan USA where he achieved recognition as being in the top 1% of Carnegie representatives worldwide. A student of human behaviour, James found the answer to the question "Why we do what we do?" through Carl Jung's work on "Psychological Types" identifying 4 dominant patterns of behaviour. Studies indicate that we spend 7 out of 10 waking minutes communicating. Yet, inability to communicate is the single point of failure within most organisations and personal relationships. He discovered that even though we might appear to speak the same language that there are in fact 4 separate and distinct dialects each looking at and filtering the world through different eyes and ears. Each of us speaks 1 dialect naturally, and that if we rely on just this one dialect that it means that we are unable to communicate effectively with 75% of the people that we come in contact with daily including family members, friends, business associates and clients. James created a new way of communicating called iMA to help change peoples lives for the better. iMA begins by identifying how a person wants to receive information, and then teaches you to modify and adapt the message in a way that is most likely to be understood. By communicating on the other persons wavelength, and speaking in a way that the other person finds it easiest to listen to, communication, trust, and co-operation go up and stress and tension go down. 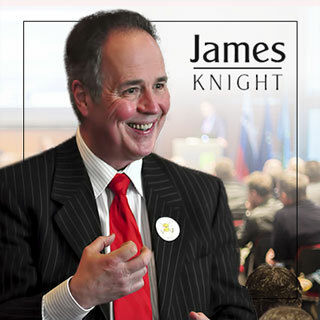 James Knight is a person of many talents but most of all a person with a passion for helping people understand themselves and others and teaching them how to use this understanding to live a richer fuller life. His speeches have entertained and educated hundreds of audiences throughout the US and the United Kingdom. His genuine enthusiasm and his dedication to personal growth and development for his audience make his presentations a unique experience. He creates energy in the room, adds humour to his presentations, and shares information and tools necessary to make positive changes in your life. If you would like to enquire about the possibility of James presenting iMA to your company, group or association, call 44-(0)1525-634210 or contact us here.